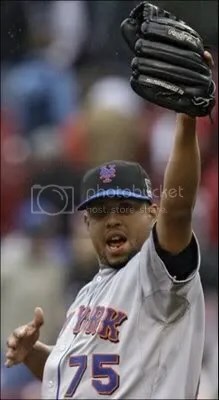 NY Mets highly emotional closer Frankie Rodriguez aka K-Rod has been charged with 3rd degree assault for attacking his father-in-law after the game in the family room at Citi Field (Mets home ballpark). Sports New York (SNY) reporter Kevin Burkhardt has reported that after the game while reporters were interviewing players K-Rod became upset when a reporter asked if was available to pitch tonite. K-Rod then yelled at reporters to “Get Away!” as he stormed off; a few minutes later Kevin Burkhardt tried to talk to K-Rod when he once again aggressively told reporters, “I didn’t pitch, why do I have to talk to you guys…”. K-Rod then left the clubhouse and entered the family room where he reportedly attacked his father-in-law leaving him with bruises on his face. K-Rod has been detained at Citi Field by the police while his father-in-law was taken to the hospital. K-Rod’s frustration comes from him not being used in tonight’s game against the Colorado Rockies. With 2 outs and runners on 1st and 2nd in the top of the 8th inning; Mets winning 2-1 and in desperate need of victories. Jerry Manuel (Mets manager) decided to not use K-Rod for the 4 out save; instead Manual with Manny Acosta who would then give up a Grand-Slam to former Met Melvin Mora. K-Rod has on more than one occasion has told the Mets coaching staff that he rather be over worked as he is more effective that way. In a big game K-Rod wants to be on the field and these days every game is a big game for the Mets. The frustration that spilled over into the altercation with reporters and his father-in-law is without a doubt a result of how Jerry Manuel is using his closer. In no way am I condoning K-Rod’s behavior; there is no reason to physically assault anyone because of what happened in a baseball game. But for the SNY team (Kevin Burkhardt and Bobby Ojeda) to say that Jerry Manuel’s handling of this team and the K-Rod incident are unrelated has to be one of the dumbest statements I have heard. Soon after making that statement Kevin Burkhardt then reports that there are Mets players who are unhappy with the way the is being run. Do me a favor Kevin its real simple; K-Rod is upset after the game because he feels he is not being properly used by the manager. Then you report that players are not happy with the way the team is being run; again by the manager. Hello Captain Obvious it’s clear Jerry Manuel’s way of handling the team is affecting everyone!!!! 1) Every game is critical and I agree with you – that’s what KRod’s here for, so send him out there – overwork him if we have too… Not to mention he’s the only guy we have in the pen. 2) Let’s be clear about KRod’s season / career as a Met – he’s been an average closer – he’s blown a ton of saves and is the reason Santana has single digit wins… So before we act like KRod’s such a sure thing – lets be clear about his track record as a Met. Point being – not sure what gives him the right to act like he’s been so good. I agree with your 1st point, use him as we have to win games and that is what he is paid for. He didnt get the saves record by taking days off. On your 2nd point you are correct that K-Rod hasn’t exactly been lights out but he says its due to his lack of consistent work. I have to believe their is something to that as I can’t believe he would lose it that quick, at times he is too in love with striking people out instead of throwing strikes. As of late he has been about throwing strikes and you can see a difference in his performance. 3rd point I can’t stand Bobby V, felt like he was too much about him, just look at how he reacted to his interview with the Marlins. Been there and done that with Bobby V ready to give a fiery competitor like Wally Backman a shot. Thanks for commenting, always appreciated!